More than two million students are enrolled in for-profit colleges, from the small family-run operations to the behemoths brandished on billboards, subway ads, and late-night commercials. These schools have been around just as long as their bucolic not-for-profit counterparts, yet shockingly little is known about why they have expanded so rapidly in recent years—during the so-called Wall Street era of for-profit colleges. 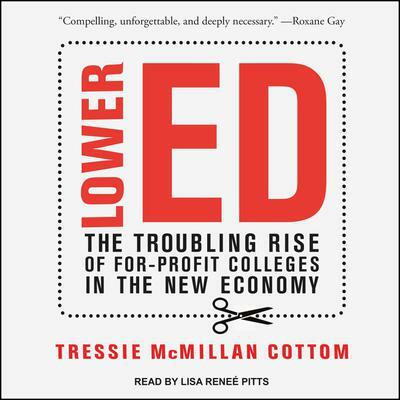 In Lower Ed Tressie McMillan Cottom—a bold and rising public scholar, herself once a recruiter at two for-profit colleges—expertly parses the fraught dynamics of this big-money industry to show precisely how it is part and parcel of the growing inequality plaguing the country today. McMillan Cottom discloses the shrewd recruitment and marketing strategies that these schools deploy and explains how, despite the well-documented predatory practices of some and the campus closings of others, ending for-profit colleges won't end the vulnerabilities that made them the fastest growing sector of higher education at the turn of the twenty-first century. And she doesn’t stop there.